A 400-year old German manuscript portrays how cats could be used as deadly explosives. It's hard to deny that cats have it made in our modern world. We feed them, provide them with shelter, and throw entire film festivals in their honor, requiring only that they pose for the occasional internet photo in return. Sadly, cats haven't always held such esteemed positions in our society. According to a 16th Century German manuscript, cats were used less for cheeseburger jokes and more for blowing up enemy encampments. An image from the manuscript, seen right, depicts a death-dealing, rocket-bearing feline in a scene that is both ridiculous and laughable, provided you don't dwell on its rather depressing implications. Feuer Buech, or "Fire Book" in English, provides illustrations of various kinds of 16th Century munitions. 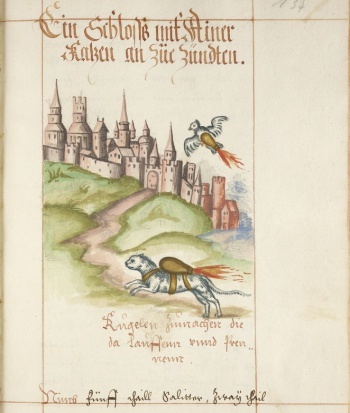 The manuscript can be examined in full on the University of Pennsylvania's library website, where one reader presumably stumbled across the subtitle "cat and bird with rocket packs" and couldn't stop laughing. The image has been slowly spreading on blogs and tumblr feeds ever since, presumably to the amused bewilderment of history buffs and cat lovers everywhere. Animals have been a part of human warfare for about as long as we've had warfare, and explosives were never an exception. During World War II, the Soviets put bomb-laden dogs in the field as anti-tank weapons while the US experimented with a pigeon-guided missile system. Of course, such programs usually led to tragic results for the animals involved, and were eventually scrapped in favor of traditional, non-adorable delivery methods. Since Feuer Buech isn't packed from cover-to-cover with animal pictures, it's pretty safe to say that these cat-based bombs weren't in vogue for very long. Which is good, because Grumpy Cat wouldn't be very impressed if we gave him the same treatment as his 16th Century ancestor, Fritz the Rocket Cat.